API load testing from simple API hammering to complex API user scenarios. Anticipating how resources will be manipulated as well as retrieved via an API requires skillful planning. API performance is affected by server availability, response times, network latency and throughput. Each of these require a different level of optimization work if found to be the source of poor performance. 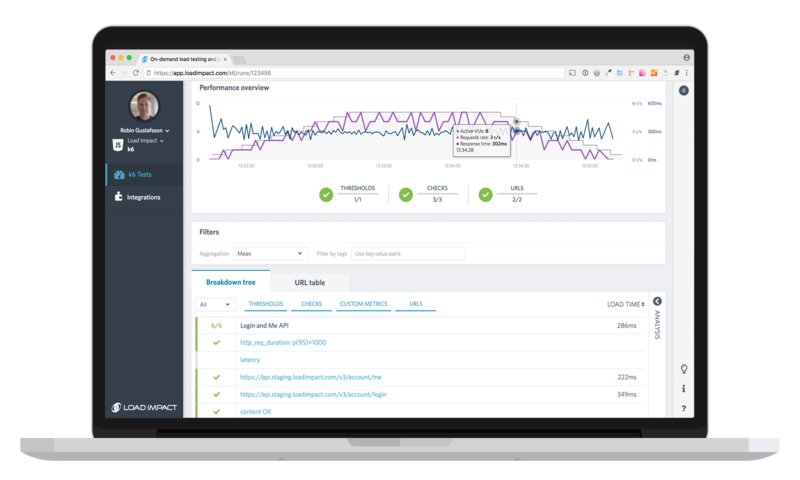 LoadImpact's cloud service and the open source load testing tool it's built upon (k6) are aimed at helping you proactively test API performance. As the rate of code deployments increase with DevOps and automation, test your APIs from early dev stages to end-to-end tests in pre-production environments. Guarantee that resources exposed by your API can be Created, Read, Updated and Deleted appropriately under expected, as well as unexpected, load. Validate application and infrastructure scalability and measure end user performance. Ensure the response times experienced by your API users are acceptable and within the boundaries of Service Level Agreements (SLAs). Establish a long-term baseline for your API performance on which to validate the impact (good and bad) of code and infrastructure changes over time. Read more about performance trending. Determine your maximum capacity, through stress testing, in order to understand which components fail first, in what order and what the nature of that failure is. With ES6 modules support builtin, it's easy to modularize your scripting logic for reuse across tests and team members. You can even use some existing Node.js modules via Browserify. Use checks (like asserts) to make sure your tests are functionally correct, and setup test pass/fail criteria using thresholds to open up the door for automated load testing with CI/CD tools and services. Test your full set of APIs with both HTTP and WebSocket support builtin, or see what speed ups you can achieve by switching to HTTP/2. Send requests with any of the HTTP methods/verbs. GET, POST, PUT, DELETE, PATCH and OPTION, they are all supported. Use custom metrics to capture the data that matters to you, with support for Counter, Gauge, Rate and Trend types of metrics. For more information see our scripting introduction and the k6 documentation. We believe load testing should be goal-oriented and want to make it as easy as possible for you to achieve that. By setting up thresholds, as pass/fail criteria, in your script your tests will be automatically failed when those thresholds are overrun. We also believe in the practice of continuous performance testing. LoadImpact is built on top of our open source load testing tool k6, and with the ability to run tests both from local/on-premise or using our cloud service makes it easy to integrate load testing with your CI tool/service of choice. To stay completely out of your way, when your tests finish, we can notify you in Slack, HipChat or via Webhook. Be the first to know if your tests fail!